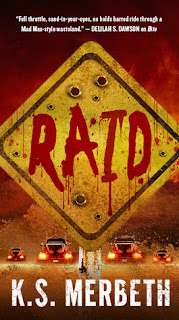 Raid is book two in the Wastelanders series. I loved book one in this series so I knew I had to grab book two when it came out. I'm so glad I did, while this does involve a new group of people in the same world, we do get a glimpse of the characters from the previous installment. You don't have to read these in order but I would suggest you do, so you're more familiar with the world. But they can be read as standalone books if needed. We start off meeting our leading lady, Clementine. She's a bounty hunter hot on the trail of any bad guy/gal that has a price on their head. She makes a living in this post-apocalyptic world by taking on jobs from the small towns she passes through and catching whoever wronged that town. Things change when someone puts a price on Jedediah Johnson's head though, you see, he's the leader of all the raiders in the eastern wastes. He's a big deal and when Clementine manages to catch him, no one wants any part of it since his crew will destroy anything and everything to get him back. She winds up taking him to the western wastes based on a rumor that she might be able to cash him in there. Boy what a journey it is for them, this novel is full of fighting and non-stop action. With this post-apocalyptic world full of raiders, sharks (cannibals), and towns people trying to survive off the last few cans of food they can find you know you're in for a thrill ride you cannot put down. Raid is an attention grabbing sequel that got me from page one. As with the previous installment I find the characters to be my favorite part about the book. Merbeth really put thought and care behind them and includes little details that just make you see them all the more clearer. Clementine is such a strong leading lady, but her childhood is subjected to so much change when bad things start to happen, it's a bit heartbreaking. You can easily tell why she is the way she is and you wind up rooting for her even if she has to kill someone. I really did miss the easy comradeship between the first novel's gang of characters. We did get some of that feeling since Clementine and Jed are traveling together but I missed the larger group feel. This installment fell a little bit short of my expectations since I loved book one so much. Don't get me wrong though, this was a great sequel, just a tad slow at times. All in all, if you're looking for a post-apocalyptic book you'll love this series. There's something about books set in post-apocalyptic worlds that draw me in so much. Too bad it wasn't a little better for you, though. Sounds good and even though it was a bit slow at times I'm glad to hear you liked it. Sorry about the slow pace, which I know can be frustrating. Glad to know you were still able to enjoy it. Too bad it wasn't as good as book 1. Maybe book 3 will be better? I am glad to hear that even though this wasn't as good as book one, it still was a solid read especially for post apocalyptic. Great review hun. Hmm. This is completely new to me but sounds like something I might enjoy as well. Thanks! I really enjoyed book one. This one was good but I liked book one a bit better.